Awhile back I came across this really ugly pair of clip earrings. I'd say they were vintage, but the only possible proof of that would be the tarnish, how the circle part stayed in place only be inserting it inside and clip and, they are REMARKABLE OUT OF STYLE. But, maybe there not. Anyway, they are really ugly. I had placed them on my side table, where they've been for awhile as I just couldn't decide what to do with them. Well, I'm (again) trying to clean off the side table and picked them up AGAIN. Decided it was time to do something with them and that I'd turn, at least part of them, into a zipper pull. So, took them part and pull all, except the black beads into the tumbler for a couple hours with some of that stuff for cleaning metal. 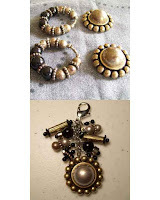 Then, started the decisions .... ummmm ... silver chain, add in a few other beads, use a little of each of the original beads .... and then, ... introducing the new zipper pull. Actually, it's not quite finished. The back of the earring part is not that attractive, so in the morning I'm going to pull out a Gold Button and glue it to the back.